Statistics for 1973 show that Sandy ran 30.59.6 for 10,000m, to finish second in a Meadowbank track event. He improved his marathon time to 2.22.53 when finishing third, only three minutes behind winner Bob Sercombe, in the prestigious Polytechnic Marathon. Later that year he managed 2.23.07 in Harlow. By 1974 he had moved to Edinburgh and joined EAC. Rab Heron has written about that year’s SAAA marathon, when “A fair-sized group of ruthless runners sheltered from the outward journey headwind, behind a protesting Sandy Keith. His pleas for clemency were met with mocking laughter and a comment that it served him right for being so big.” Unsurprisingly, Sandy slowed to 2.25 and fourth place. However just two weeks later he thrashed the bronze medallist, Colin Youngson, who had run 2.21 in the Scottish. In the Inverness to Forres marathon, Sandy was victorious in 2.26.28, while Colin could only manage 2.33. Those two were rivals and occasional training partners that Winter and next Spring. Sandy could absorb a tougher weekly workload (over 100 miles); while Colin could only manage 80. However both trained very hard and were approaching their peaks. In the 1975 SAAA event in Edinburgh, Sandy raced fast from the front, allowing Colin some shelter into a slight headwind. However Colin broke away at 19 miles and managed to finish in a championship record of 2.16.50, while Sandy produced a fine PB of 2.17.58 to win silver. By the end of the season, although the pair were ranked 5= in the British marathon merit rankings, Sandy had improved his best to 2.16.12, which made him fastest Scot of the year (and 53rd man in the world rankings). He never ran a faster marathon. In addition he had made his debut for Great Britain, finishing in 2.18.43 to secure an excellent 2nd to England’s Ron Hill in the Enschede marathon, Holland. His 10,000m time was reduced to 30.29.4. 1976 was Olympic year, and Sandy Keith performed valiantly in the AAA trial event in Rotherham, on a hot day over a hilly course. He finished 6th in 2.19.02, having hung on as long as possible to the three men (Barry Watson, Jeff Norman and Keith Angus) who were selected for the Montreal Games. Sandy had to content himself with another British vest in a foreign marathon. On 31st July he was victorious in the marathon at Noordwijkerhout, Netherlands, in 2.21.43. Three weeks later he had a go at the Two Bridges 36mile ultra, recording 2.29.42 at the marathon checkpoint. Former Comrades Marathon victor Mick Orton from Tipton Harriers finally won the race in 3.27.58. To cap an excellent season for Sandy Keith, the prestigious D McNab Robertson Memorial Trophy was awarded to him by the SAAA, along with the well-deserved title of Scottish Road Runner of 1976. The 1977 SAAA event in Edinburgh featured Jim Dingwall breaking the championship record once and for all: 2.16.05. Sandy finished third in 2.18.52. That was at the end of June. The virtually indefatigable Mr Keith raced three further marathons that season. On a blistering hot day, he ran 2.20.44 on 27th August for eighth in a top class international event in Enschede, Holland. Then 2.24.19 on 16th September; and 2.16.03 (short course) on 16th October, at the Cleveland marathon near Middlesbrough. Sandy finished second to Mike Critchley (2.13.28). However the course was deemed to be up to 1180 yards short. Still a fast run! 1978 must have been a disappointment to Sandy Keith. Once more he performed admirably in the trial for a major Games marathon; and once more he narrowly missed out on selection. This time the event was the AAA at Sandbach in May, when he finished well up in 2.18.15. Unfortunately only Jim Dingwall was selected for the Scottish team at the Edmonton Commonwealth Games. Nevertheless, Sandy raced two further marathons that year: 2.20.42 on the tenth of June at Snoek, in the Netherlands; and 2.20.01 on the 15th of October, when he was fourth at Cleveland, less than a minute behind the winner. Sandy started 1979 with a relaxed but exotic run in Bermuda (2.30.34) on the 28th of January. After a serious build-up, he ran 14.41 for 5000m and then, eight days later on the 17th of June, produced yet another excellent result in Sandbach, finishing second in 2.17.39. In October came another speedy second place (2.18.08), in the very first Glasgow Marathon, only 23 seconds behind the fast-finishing Olympian, Barry Watson, after battling it out for 24 miles. Thereafter, Sandy kept training hard, but avoided the marathon for a while. From 1976 he had been a prominent member of EAC teams who won three silver medals in the Edinburgh to Glasgow Relay. In addition his team won two gold medals and one silver in the Scottish National Cross Country Championships. 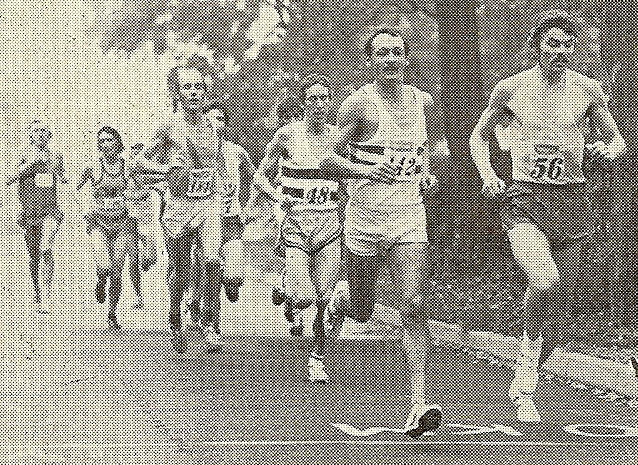 Sandy’s finest run in this gruelling event was in 1978 at Bellahouston Park, when he finished 11th individual. Another important ingredient of his ‘race training’ was annually blasting through a number of the traditional ‘shorter’ Scottish road races. Sandy won several, including the tough Fort William 10, the Perth 15, the Edinburgh to North Berwick 22 and the first two ‘Seven Hills of Edinburgh’ events in 1980 and 1981. Evan Cameron (SAAA marathon winner in 1985) has written that, from 1979 onwards, “five days a week, the morning started with a very rapid 8 mile run with Sandy Keith. These runs were always conducted running side-by-side, neither one of us conceding an inch to each other. Sandy became a mentor to me, offering advice on race tactics and on the need to introduce speed and hill sessions to what had previously been a regime of one-paced runs. Our morning sessions really helped me build towards weekly targets – provided I rested physically while at my desk job during the day!”In 1982 Sandy made a brief comeback to marathon racing, although not at his previous high level. However he did win silver once again (2.26.34) in the 1982 SAAA marathon in Grangemouth,; and ran 2.24.25 in the Glasgow marathon. After moving down to Newcastle, Sandy did continue to race as an Elswick Harrier for a while over the country and on the roads but eventually retired from the sport. He is rumoured to be living in Galashiels nowadays, still looking very fit. Perhaps the veteran scene did not appeal and years of exceptionally hard training had dimmed his enthusiasm for racing. However he undoubtedly achieved his potential, while earning a reputation for strength and consistency as an international marathon runner. Sandy Keith is remembered with considerable respect by anyone who attempted to keep up with him at his impressive best!